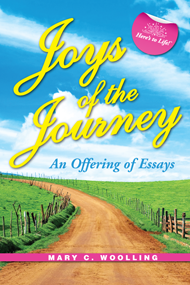 Author Mary C. Woolling invites you to step back from the hectic traffic of life’s journey into an enchanting world of awaiting joys. Readers set out on a relaxing expedition of discoveries, encouragement, and simple pleasures. You’ll take a stroll down a peaceful path meandering through shady, wooded groves and open, sunny meadows; winding past babbling brooks and fragrant fields of wildflowers; and treading upwards through cool, verdant hillsides. On this refreshing high road, things happen at a restful pace and are viewed from a gentler perspective. Mary cautions us not to be too hasty in our travels through this journey for, in so doing, we might miss out on some of the greatest delights of our world that surround us in full measure. Indeed, they are right before our eyes, if only we take the time to recognize them. Regardless of what you may be facing in your journey today, boundlessly optimistic Mary encourages her readers that a multitude of indisputable reasons to be joyful stretch out in all their glory on the road before us. This unique volume also serves as a journal, intended for you to capture your personal reflections and insights as you read along. Please do not be hesitant about writing in this book. Through journaling, we can gain a greater understanding of ourselves, those around us, and even of life itself. Chronicling the story of your own journey may also provide you with a sense of affirmation and fulfillment. Such are the happy trails you will discover when you embark upon the Joys of the Journey.